For Ollie, there was no doubt which theme we would choose for his 4th birthday party. Dinosaurs. He loves them and things got a little dino crazy over Christmas. He had 'Switch and Go Dinos', dinosaur books, dinosaur clothes, dinosaur toys and if anything, his enthusiasm is growing. Although I started looking at ideas before Christmas, I was far too busy to really sit down and plan the specifics for Ollie's party. However, with the festive fun (and failures) now over, I have been planning in earnest. I've found it really easy to gather ideas online. Pinterest and Instagram are full of amazing dinosaur themed parties for all ages and I get easily sidetracked looking at all the possibilities. For this event, I wanted to keep things simple, yet stylish. We're not extravagant and my focus for parties tends to be on traditional games, food and activities that look nice. And balloons. I love balloons. My first turning point for stunning inflatables is always the fabulous Bubblegum Balloons. You can check out their Instagram for some truly amazing installations. I've used their products before after discovering them via notonthehighstreet.com when buying stuff for Lily's Rainbow Party and have been a fan ever since. For the Dino Party, I love the combination of greens and blues in their garlands, bunches and party packs. 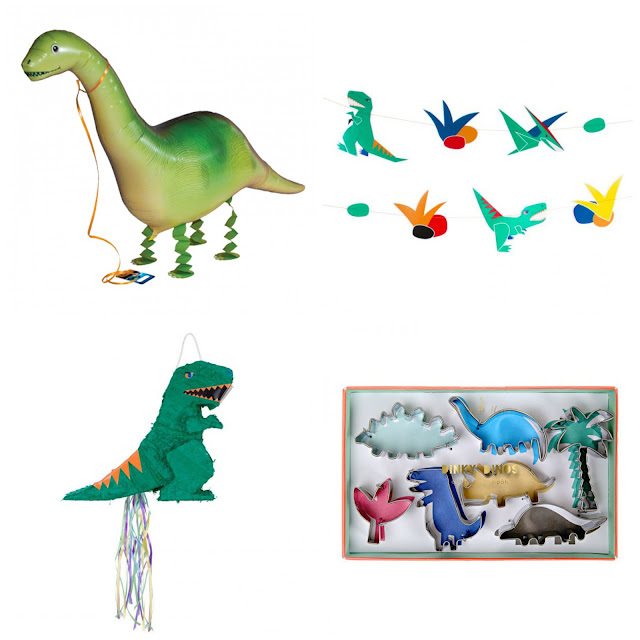 I particularly love the Balloon Cloud Kit and the Dinosaur Crazy Balloon Bunch which has a great selection of different shapes and sizes. 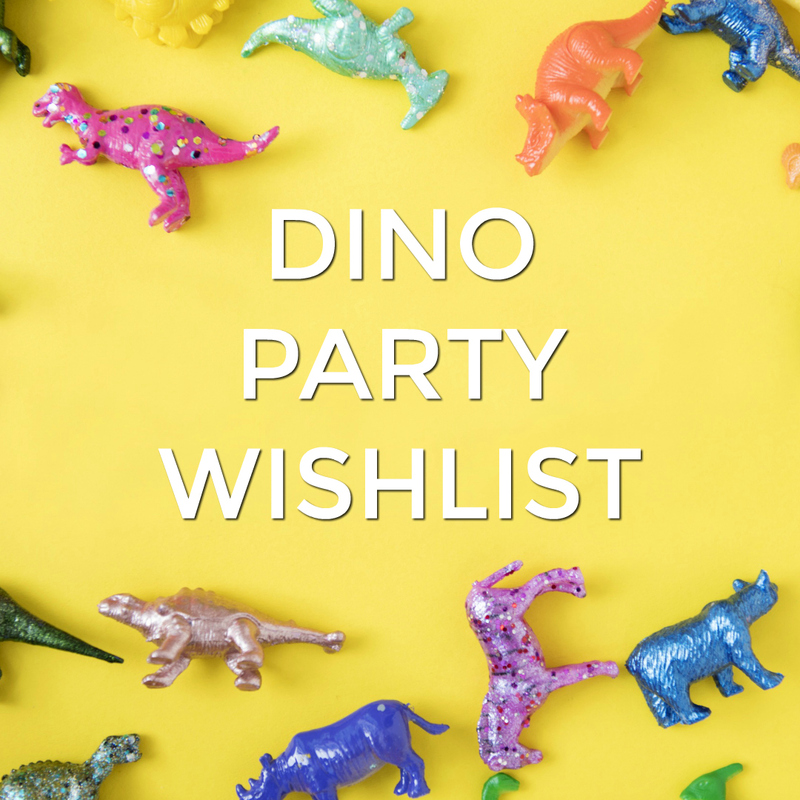 They also have a foil Jumbo Apatosaurus and different species which I think would go down well with the birthday boy and his friends. On a budget, I liked this party pack of Confetti Balloons which look great for less than £10. As always, I'm working to a budget and have big aspirations for my limited funds. With that in mind, January is actually a really good time to pick up some bargains in the sale. 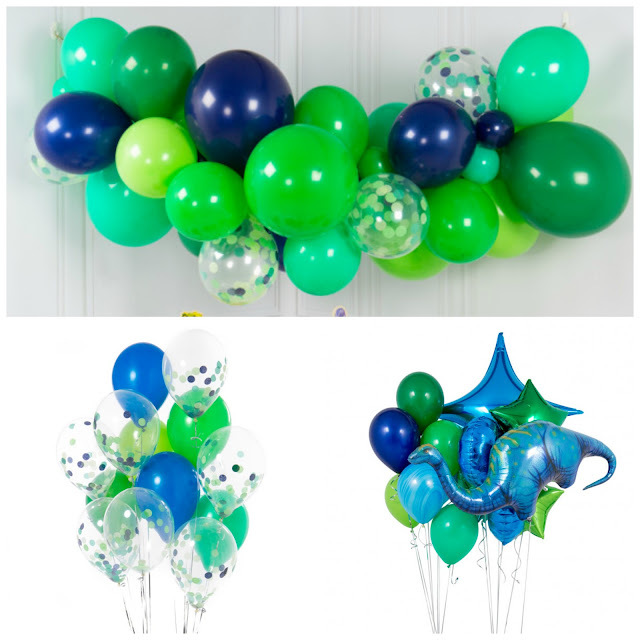 I always find Party Pieces have a great selection of decor and themes at a good price and was pleased to find some of the items I wanted were on sale, including a canister of helium for the all important balloons. I really liked the 'Tropical Fiesta' range of napkins, cups and plates for evoking the feel of a 'dino jungle' - they'll go really well with the leaf shaped platters I have leftover from Lily's Tropical Party. Party Pieces are also great for other decorations, party bags and fillers. 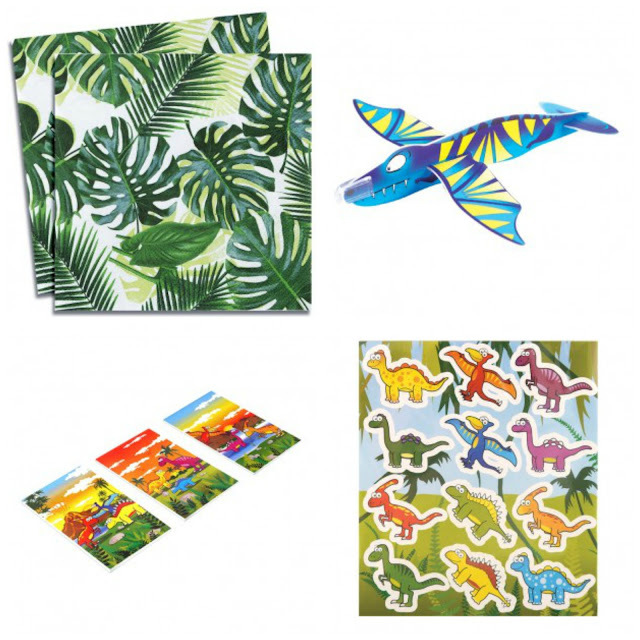 Like these stickers which are also reduced in the sale and these dinosaur gliders and notebooks. For themed party accessories that are a little different, I'm a fan of the Original Party Bag Company. I have fallen in love with the Brontosaurus Airwalker Balloon and I know Ollie would love one. They also stock stylish and original brands like 'My Little Day' and 'Meri Meri'. I particularly like the brightly coloured Dinosaur Party Garland and the Dinosaur Pinata although I'm not sure about letting Ollie and his friends loose with a big stick! I love finding new suppliers and discovering new product ranges. I hadn't heard of Papier Party before but I think they're set to be a new favourite of mine. 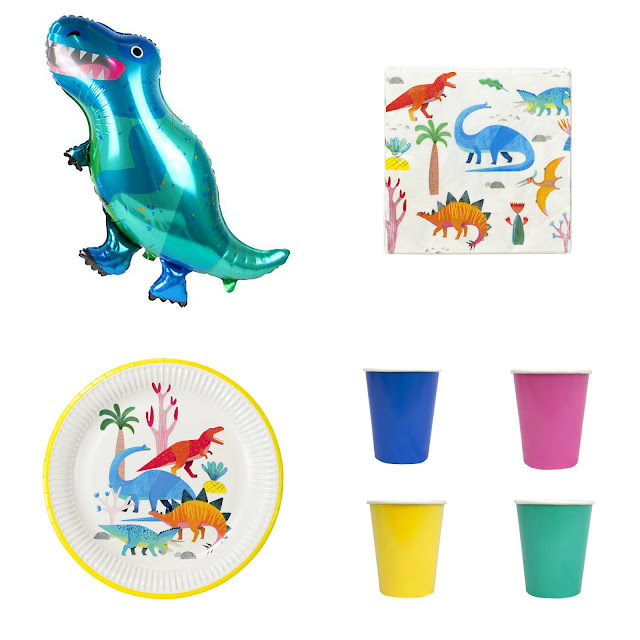 Their styling for the Talking Tables 'Party Dinosaurs' range is bright and fun and I've fallen in love with it. I like the addition of these brightly coloured cups and this friendly looking foil Dinosaur Shaped Balloon. It doesn't quite go with the look I've planned but I'm tempted to pick up some bits anyway. I've still got a while to go with my party planning. The more ideas I get the more I find to add to my list. I have most of the ideas in place, the tricky part now is staying on track and not splurging on extras. I'll need iron-strong willpower over the next few weeks! I'll keep you all updated on my planning. You can see how I plan events here and can check out all my Party Planning posts in one place here. Have you got any events coming up? Let me know in the comments!